CIFASD investigators scanned the rains of 92 children with prenatal alcohol exposure and 83 children with no exposure. Cortical gyrification was altered in those exposed to prenatal alcohol, suggesting that brain maturation was atypical/delayed. These effects may be long-lasting and would be expected to reflect cognitive impairments. 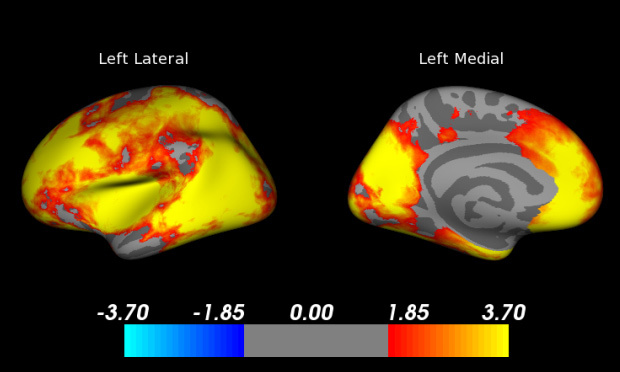 The picture shows areas in the brain in which cortical develpment was related to intellectual functioning. It may be possible to someday use these measurements to determine the amount of brain growth delay in individuals with FASD. More importantly, these data suggest that the field may benefit from focusing on neurodevelopmetnal interventions and cogntive therapy strateiges that are targeted at high-level cognitive skills such as those made possible by maturing cortex.